Is defined as labored respiration during sleep caused by airway obstruction. If you suffer from SDB, as you fall asleep you experience a loss of muscle tone called airway patency. The soft tissues in your airway relax against the tongue, partially cutting off air flow to your lungs. SDB can be severe to the point of complete airway collapse. Those who suffer from SDB experience breathing difficulty ranging from mild to acute; snoring, upper airway resistance syndrome (UARS), and obstructive sleep apnea (OSA). Snoring is always indicative of the development or or existence of a sleep breathing disorder. UARS is more common in younger women, and is often accompanied by headaches, Gastroesophegeal Reflux (GER), and asthma. OSA is, as defined by the National Heart, Lung and blood institute, “a breathing disorder characterized by brief interruptions during sleep… repeated periods of no breathing for at least10 seconds at a time.” These periods are called apenic events and can last longer than one minute. SDD concentrates on reducing respiratory distress (your breathing problems at night) by determining the location and degree of airway obstruction and placing your airway in optimal breathing position to restore its patency. After establishing your optimal breathing position, your dentist will fit you with an oral appliance. An oral appliance looks like an athletic mouth guard, but much less bulky. Using the Eccovision, your dentist can place the oral appliance correctly, allowing for maximum airway patency. The oral appliance gently holds your jaw in the right position to maintain proper airway function as you sleep. 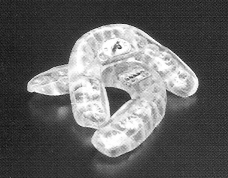 Successful treatment is achieved by simply wearing the oral appliance at night. It is important that you treat your disordered breathing problem as soon as possible.